Audiences for The Sense of an Ending are likely to be older people who can grasp the emotional wallop of an old man exploring his past. Young people with just a blink of a past are thinking about present and future, not about the ups and downs that formed them. What we have here is an upper middle-aged man digging hard to understand a major sadness in his early life. Prepare to be confused as you follow a slew of actors from school years through life to early old age. They give us six characters at different ages in shifting times. It’s worth the effort. Tony Webster (Jim Broadbent/Billy Howie) is the proprietor of a small camera store that sells old Leicas. Divorced, he is alone most of the time. Tony has learned of the death of his closest school friend and is searching for the diary he now knows Adrian (Joe Alwyn) left behind when he died. When he learns it is in the hands of his old love Veronica (Charlotte Rampling/Freya Mavor), Tony sets out to see her again to claim the diary and reconstruct his past. That’s a simplistic summary of a complicated story. Though there are approximately five main characters, they are played at different ages by different actors. So jump to ten actors, old and young, who appear, vanish, and reappear without help from the filmmakers in identifying who is who. It gets easier the more we hear their names, harder when Jim’s comments switch from reality to memory. And that is the last negative thing you will hear from me about this otherwise appealing movie. As Jim summons his memories, listen closely for what his personality and time have done to his past. We watch Jim and his ex-wife Margaret (Harriet Walter) reunite to help guide their daughter Susie (Michelle Dockery) through single mother childbirth. We watch him as a young man lose young Veronica (Freya Mavor), the love of his life, to his best friend Adrian. As Jim finds each of the women who played major roles in his earlier life, he must test his own memory against theirs, and we in the audience have the job of sorting the true facts of the mystery he has constructed in his head. What’s important to know is that every one of these actors gives a fine, often subtle performance. 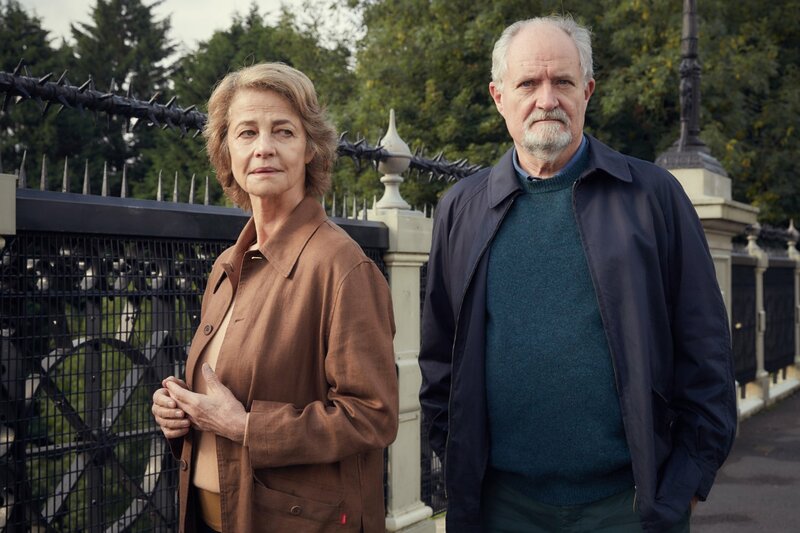 Add to that the impact of Jim Broadbent and Charlotte Rampling as long ago lovers who meet in much older age and you will see an amazing mixture of restraint, resentment, and love tamped down. These two can deliver moods that are both subtle and overpowering in the same moment. Their brief time onscreen together is a gift of quiet talent. While the young actors deliver the remembered moments, their elder selves give us those memories wrapped in the reflections of many decades. Quite suddenly, we in the audience realize we are doing the same. This review was posted on March 25, 2017, in Drama. Bookmark the permalink.